I'm a young spayed female black and white Domestic Short Hair. I'm a super sweet girl with a friendly personality. 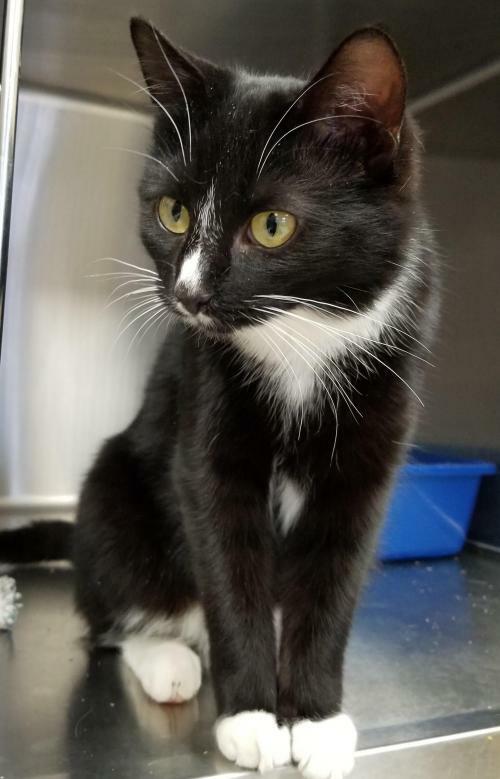 Because I am confident and outgoing, I'll be a great addition to just about any home. I arrived at the shelter as a stray and no one ever came to reclaim me. Unfortunately, this is what happens to more than 97% of pet cats in shelters nationwide. Why don't people even bother to go look at their local shelter for their lost cat? That's a real mystery with no good answer. Anyway, now I have a chance to find an adopter who really loves and cares about me! I'm currently staying at the shelter's satellite adoption center in PetSmart West of Madison. Come see for yourself how awesome I am! My adoption fee is $80.00. I have been spayed, vaccinated, microchipped, and I've received routine treatment for internal and external parasites. I have tested negative for Feline Leukemia and been tested for FIV.